I still didn't get around to processing the St. Patrick's Day shots, because I went for a walk around the University of Toronto area. I need to process them now too! 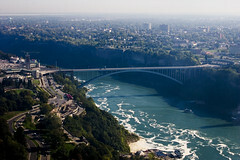 So here is a photo from the Niagara trip I took in the summer. This is taken from the top of the Skylon Tower. The falls made the atmosperics a bit weird, but it came out ok.